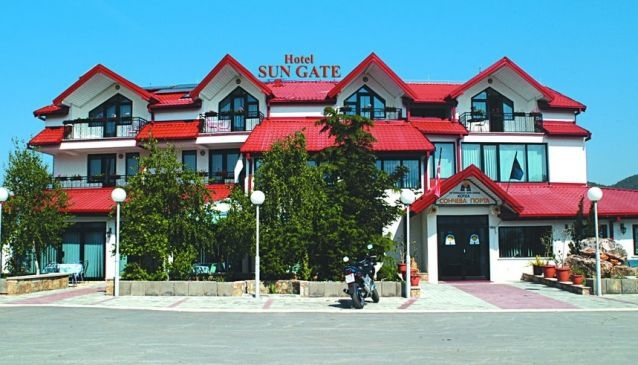 Hotel Sun Gates is conveniently positioned on one of the most beautiful part of Ohrid which is surrounded with pine forest and enjoys breath-taking views of the Ohrid Lake and the overall Ohrid and Struga region. With cosy and peaceful ambiance, this hotel provides relaxing and refreshing vacation, away from the city noise. It offers sophisticated rooms, each equipped with TV, mini bar, cable channels, wireless, air condition, direct phone line and private bathroom. This lovely hotel also boasts conference hall and two restaurants from which one serves traditional Macedonian dishes and the other one is superb for special events and occasions. Guests will be astonished by the warm hospitality of the friendly staff, as they will always make your stay here pleasant and welcoming.